Channel 4 has launched a new look across its family of channels, with all services sharing the same "4" logo for the first time. The broadcaster says the network rebrand will unify the digital channel portfolio consisting of More4, Film4, 4Music, 4Seven and E4 whilst maintaining their strong individual brand personalities. In addition, the Channel 4 corporate logo will also evolve from the multi-coloured 3D design to the original 2D Lambie-Nairn design. 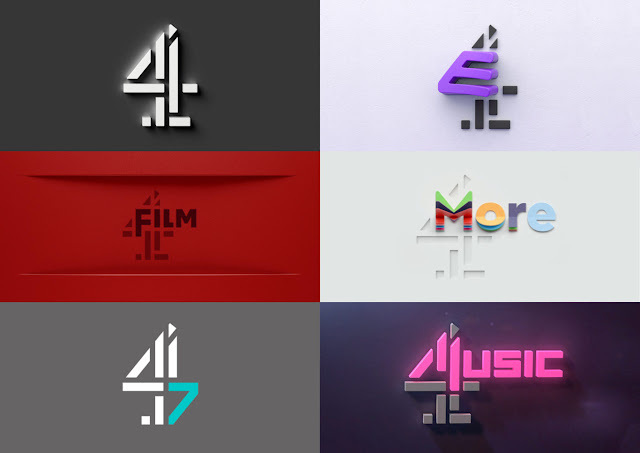 The new logos will all incorporate the iconic 4 more prominently, emphasising they are all part of the Channel 4 family. Credit: Channel 4. Go full screen by tapping on the symbol in the bottom right when playing. Mobile users may need to rotate their screens. Until now, Channel 4 has had the only family of channels with no common logo. The new E4 logo, introduced in 2001 and last refreshed in 2013, will keep its purple colour and will have eight new opticals to showcase the "mischievous, rebellious personality of the popular youth-focused digital channel." There will also be 19 new on-air idents. The work has been led by Channel 4’s award winning in-house creative agency, 4Creative, in collaboration with selected creative partners, including ManvsMachine. E4 ident "Chippy". Credit: Channel 4. Go full screen by tapping on the symbol in the bottom right when playing. Mobile users may need to rotate their screens.